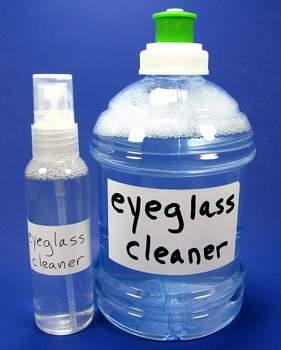 Do you want to make a low-cost cleaner for your eyeglasses? This homemade eyeglass cleaner is surprisingly cheap and easy to make. Many eyeglasses today are manufactured with some sort of coating on the lenses. These coatings include anti-scratch, anti-reflective, and anti-fog coatings. Many eyeglasses today are manufactured with some sort of coating on the lenses. These coatings include anti-scratch, anti-reflective, and anti-fog coatings. The manufacturers of these coatings generally do not recommend using alcohol on a regular basis to clean your eyeglasses. Ammonia and many window-cleaner products are a no-no as well. What they do recommend is soap and water. The Crizal website has a section on how to clean and maintain your eyeglasses. On this page they recommend cleaning the glasses in the sink with plain dish soap. What’s Wrong With Using Dish Soap? Although dish soap will work, I find that a thinner cleaner is less messy and much easier to rinse off. Some dish soaps also contain petroleum products, which we just don’t need for eyeglass cleaning. Crizal also has a cleaning FAQ page about cleaning coated lenses. This page states that you can use a microfiber cloth to clean your glasses when it is not convenient to wash your lenses. I believe they mean that you can clean the glasses dry without using a lens-cleaning solution, but only if you have a high-quality cloth. Their FAQ also states that an alcohol-based cleaner can be used occasionally, but is not recommended for daily use. This recipe is about as gentle as it gets. It should be safe for all eyeglass coatings. It is also easy to make. Don’t use a baby wash that has things in it like shea butter or cocoa butter. These moisturizers will leave a hazy residue on your glasses. We don’t want that. We also need some containers to put it in. I chose an 18 oz Arrow water bottle to store my cleaner in. You will also need some of those little fine-mist spray bottles. It is nice to have more than one. You could leave one at work, put one in the car, and have one by the sink. If you need a good microfiber cleaning cloth, see our recommendation for The Best Microfiber Cleaning Cloth For Camera Lenses And Eyeglasses. 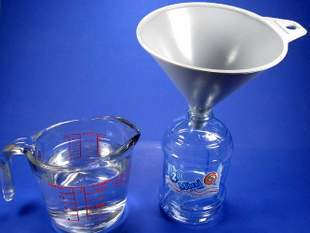 Measure 2 cups of distilled water and pour this into the container of your choice. If you are going to use a funnel, make sure it is clean. We don’t want any grit or debris in our eyeglass cleaner. Now pour 1/4 cup (4 tablespoons) of the baby wash into the container. This comes out to a 1 to 8 ratio of soap to water. First pour 2 cups of distilled water into the bottle……. Then, pour 4 tablespoons of the baby wash into the water bottle. Mix the cleaner by turning the bottle upside-down then back upright several times until you don’t see the baby wash swirling around in the water. This is a better than shaking since it doesn’t make as many bubbles. Once it is mixed up you can fill up your little bottles out of the big bottle. The neat thing about using an 18oz water bottle is that you don’t have to measure the baby wash. The 2 cups of water and the 1/4 cup of baby wash equals exactly 18oz. So all you need to do is put in your 2 cups of water, then fill the bottle the rest of the way with baby wash! If you will be using this mixture to wash your glasses in the sink, then yes, you can make it with tap water. On the other hand, if you want to use this at your desk or on-the-go, I personally would use distilled water. 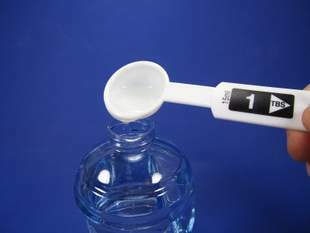 Tap water may contain impurities or sediment. Since there is no rinse, I feel better using pure water. It is important to label your bottles so that other people know what is in the bottle. Since this is a clear cleaner, we don’t want anyone mistaking it for water and taking a drink! It is a very safe mixture but it probably doesn’t taste very good. For more information, see our article about labeling homemade cleaners. Always label your homemade cleaners. 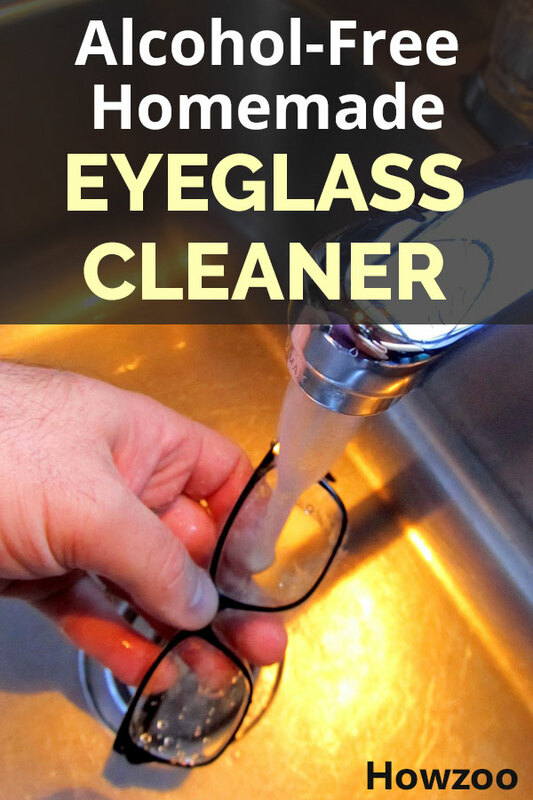 This is the best way to clean your eyeglasses because you can rinse off any grit or dirt before you start wiping the lens. This helps prevent the formation of fine scratches. First, rinse the glasses to remove any contaminants or particles. Then spray the lenses with the cleaner and clean them with your finger. Finally, rinse them off under the tap and dry them with a clean microfiber cloth. You will find that this cleaner is much easier to rinse off than a thick dish soap. This is where you spray the cleaner onto the lenses and then immediately wipe it off with a cleaning cloth. This method works, but can eventually lead to fine scratches that give the lens a hazy appearance. If you get new glasses every 2 years or so, it may not matter. I have found that it works better if you have two cleaning cloths. Use one to clean and the other to dry and polish. It is hard to get a good polish with just one cloth. You can make a little over a gallon of this cleaner for around $2.50. The cheapest store-bought eyeglass cleaner that I could find is $2.88 for an 8 oz bottle. This works out to $46.00 per gallon! I was shocked to learn this and had to recheck my math. I then went online and found some of the “good stuff” that was $275.00 per gallon ! $275.00 per gallon for a product that is water, rubbing alcohol, and soap ! My friends, we are in the wrong business ! Thank you for sharing! I will definitely make a batch to clean my multiple spectacles. Sorry for the late reply but I wrote an article about these cloths here. Thank you for the tips. Is there a difference between baby wash and baby shampoo? They are pretty much the same thing. You could use either one. The bottle of baby wash that I have states on the label that it is for hair and body. It is a bargain version of Johnson’s Head-To-Toe baby wash. I would just use the cheap stuff to make cleaner with. Thanks for the tip Rameez. yes – great – but we need to clean our glasses when we are on the road in the car – which is why I love being able to make a bottle up and stash it in each car, my purse, etc. If we’re not supposed to use alcohol on our glasses, why do all of the many brands of eyeglass cleaner that I have include it as an ingredient??? Alcohol is ok to use on normal glasses. I use it myself on my polycarbonate-lens reading glasses. This article is mostly aimed at wearers of No-Glare lenses such as those made by Crizal. I have a bottle of store brand baby shampoo that I’d like to use in the making of this cleaner. However, it’s yellow (like ‘regular’ Johnson & Johnson’s Baby Shampoo), not clear like the generic baby wash shown in the above picture… Will this make a difference in how well the cleaner will work? Regular “white” vinegar will take care of this chore in a snap! Also, before spraying my glasses with *any* type of cleaner, I always rinse them off in the sink under plain tap water, without touching the lenses. That ensures there’s no dust or other debris which might scratch the surface of the lenses when I proceed to actually wash them! At the same time, I always wash my hands; then I’m certain there’s no dirt, grease, or oil that’ll transfer onto the lenses or cloth that I’ll be using for the cleaning! For some odd reason I have found that rinsing the lens with cold water does better then hot. You would think the soap would do better in hot or warm. I noticed the guy I buy my glasses from, he is an independent, been in business for years, not a company store, used cold water. Thought it was strange. Then I read that hot/warm water wasn’t good for the coatings on the lens, not sure about that, but the cold water does seem to make a difference. Some labels get stickier if you use alcohol. WD40 is great for removing stubborn labels, tape residue, etc..
Best of all for removing labels is your hair dryer! Surprisingly enough it doesn’t take much heat just enough to warm the label and the soften the glue and it lifts right off. Thanks so much for sharing this. I tried a test batch and was hooked. Actually just made my 1st 32 ounce bottle. I lucked out and had everything I needed at home already except I exchanged a fragrance free actually everything free soap (because of my skin and fragrance allergies). Just wondering why I can not use plain tap water when making your recommended cleaner? You can use plain tap water if you wish. I am going to update this article soon with new information. Thanks so much for the information. Please whivh type of alcohol product can be used to produce home made lens cleaner and the quantitiy needed? I am planning on writing an article about a homemade lens cleaner that uses isopropyl alcohol. I have already been using it myself for a couple of years now. I mainly use it on my uncoated polycarbonate-lens readers. I also have a pair of coated progressive lenses that I use this alcohol-free cleaner on. Sign up for the newsletter and I will send you an update when I get the article posted. Will regular dish soap diluted with water work? Yes, Essilor that makes Crizal lenses, states that you can use dish soap. Baby wash is a gentler cleaner however and would be better for your skin.